I received the newest Portland magazine today and noted the passing of Mike Boyle, Class of 66. Mike was a good all-around athlete from Billings, Montana. He made his mark in Track and Field, still holding the UP long jump record, set in 1965. Mike also holds top ten spots in the 400 and the 400 Intermediate Hurdles. Hopefully some other PN elders remember Mike. Mike and I were classmates at UP. It is my recollection that Mike was an engineering major. After graduating from UP Mike went to work for the Puget Sound Naval Shipyard, eventually transferred to Bangor, Maine in 1983, and to Kingsbay, GA in 1987. He was greatly enjoying his retirement in Aransas Pass, Texas where he designed and managed the Palms RV Park at the time of his death at age 68. Another fine Boyle runner was Mike's younger sister Trisha (Lightel); also a UP grad now living in Scottsdale, AZ. Yes, I remember Mike (and Trisha). 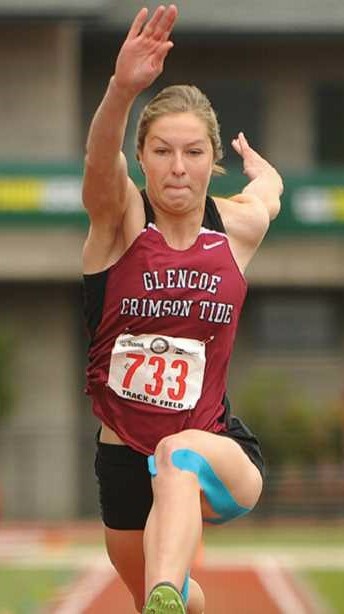 HILLSBORO TRIBUNE PHOTO: ZACK PALMER - Glencoe senior Courtney Vacek takes flight during the girls triple jump competition on Saturday at the Class 6A track and field state meet at Hayward Field in Eugene. Vacek won her second straight championship with a leap of 39 feet, 4 inches, which ties her for the fifth-best mark in Oregon history. @KenGoe wrote: Great effort by University of Portland's Will Kinkaid, who made a gutty bid around the final turn of 5k. Finishes 5th. Not on form charts. Scott Leykam @slaykem wrote: Great job by Woody Kincaid to represent the @PortlandPilots proud and finish 5th at NCAA Championships in the 5000 in Eugene on ESPN. Guess that means the Pilots scored team points.